Cold weather and your dog: keeping your pet safe and comfortable. The cold weather is back! All the leaves are down and the nights are getting longer. Suddenly, all you want to do is curl up on the sofa with a lovely warm drink and a blanket! You are certainly comfortable, but what about your dog? 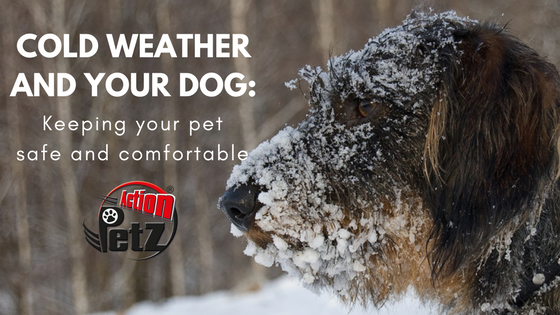 Is your pet truly as safe and comfortable as possible in the cold weather months? Read on to find out more! One of the most widespread beliefs is that a dog, no matter what breed, is perfectly able to stay outside for hours in the cold. While this might be true for some breeds (Huskies, Malamutes and Samoyeds, to mention a few), most pooches need a bit of extra care to keep them safe, healthy and comfortable during the coldest months. The truth is, most of our dogs are indoor pets; they are used to the same lovely home comforts as we humans, particularly a warm and dry home. This doesn’t mean dogs are not able to endure walks outside; what it means is that some breeds are more prone to feel the cold than others. It is also worth considering that, while the thermometer outside might not register extremely low temperatures, it gets windy and rainy in the UK. A strong cold wind combined with a dousing of rain can quickly lower the body temperature of a dog. To summarise: if you’re not comfortable outside and have to wear layers upon layers of warm clothes to enjoy a walk, your dog probably needs some warmth too! As we mentioned above, our pet dogs are very well used to the same home comforts we are; this includes central heating and dry places to sleep and relax. This doesn’t mean dogs are completely incapable of being outside while it’s cold, we just need to exercise common sense. As a rule of thumb, dogs with thicker coats (Huskies, Malamutes, Samoyeds, etc. ); and/or with undercoats (Collies, Corgis and St. Bernards, etc.) are more prepared to withstand the cold. On the other hand, dogs with short coats and/or no undercoats (Greyhounds, Whippets, Dobermans, Dalmatians, Bull Terriers) might not cope too well. We also need to consider that puppies, elderly dogs and small breeds with short legs (like Dachshunds and Chihuahuas) might also be at risk during the colder months. 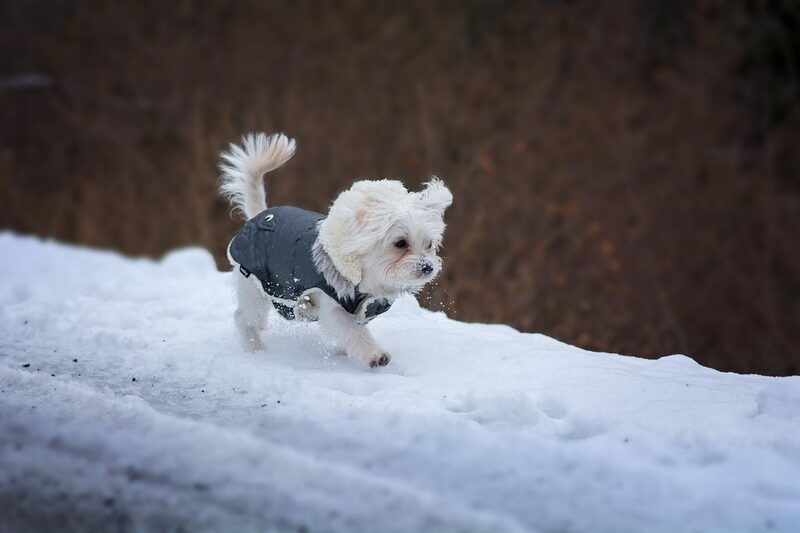 Small, short-legged breeds might struggle to walk on wet surfaces, ice or snow for a prolonged amount of time. The cold weather might make it a lot harder for senior dogs to get around by exacerbating aches, pains and arthritis. And last, but not least, energetic puppies might make you think that the cold weather is the last thing in their mind, however, we need to keep in mind that a puppy’s coat isn’t fully developed yet, plus puppies have significantly less body mass to generate heat. HOW CAN YOU TELL IF YOUR DOG IS FEELING THE COLD? Shaking or shivering: the most common sign. A dog shivers because his body is trying to generate extra heat. Lack of movement: just like with people, a dog that’s cold might not want to move too much. Therefore, if your dog refuses to keep walking, or is constantly stopping for no apparent reason it might be time to warm up. Whining or barking: if your dog is barking/whining without a very good reason, it might be his/her way of saying they have had enough. Posture: a dog that is comfortable looks relaxed, his movements will be fluid and slightly floppy. A cold dog might look a bit stiffer when walking around. Some dogs will try to lift their paws as a way of getting some relief from the cold ground. Heat seeking: if your dog lies in front of the fire, tries to get more cuddles than usual or is trying to sleep in a tight curled up position, it might be time to give him/her a blanket and a warmer place to relax. This is also a perfect excuse for a doggy snuggle! Hypothermia can be fatal if unattended, for mild cases it’s recommended to take the dog indoors and try to raise his body temperature as indicated here. Severe cases of hypothermia need veterinary attention. Safe for our roads. Not safe for our pets. Antifreeze: the liquid we use to de-ice our cars is proven to be lethal for most animals, this includes dogs. 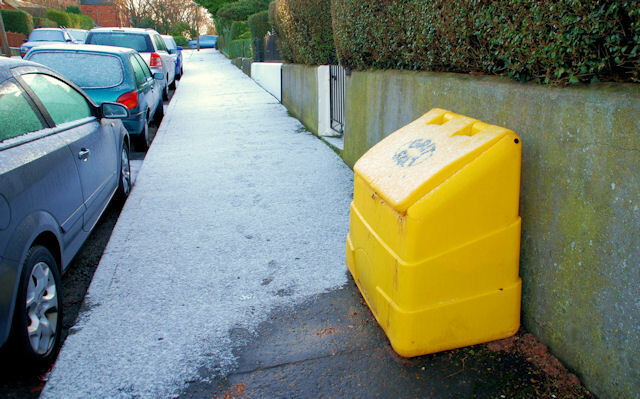 Rock salt: this is the type of salt gritters use to keep our roads and driveways ice-free. The risk with rock salt is twofold; it might damage your dog’s paws and it can also be extremely poisonous if ingested. Frostbite: according to PetMD frostbite “often occurs when a dog is exposed to the cold for an extended period. The skin of a dog with frostbite becomes very pale with a bluish/white hue due to a lack of blood flow. When the body part is warmed and blood flow returns, the skin becomes red and there is swelling accompanied with peeling”. Severe frostbite might lead to painful lesions and possibly amputation of the body part affected by it. KEEPING YOUR DOG WARM, HEALTHY AND HAPPY! After reading about the risks of cold weather, it is now time for solutions! The list below is covers the most common and important steps a dog owner can easily follow to keep their beloved pooch warm, healthy and happy during the colder months! Everybody in! Winter is a lovely time for everybody to snuggle up at home. This includes the pooch! Even if your dog is an outdoor enthusiast that doesn’t seem bothered by the cold. You can mentally exercise your dog indoors by creating food puzzles and playing brain games. Coats and jumpers: clothes for dogs have a bit of a bad rap. However, when it’s cold outside dog clothes can be an invaluable asset in keeping your pooch warm and dry. There are thousands of options, from technical fabrics to simple cotton vests. 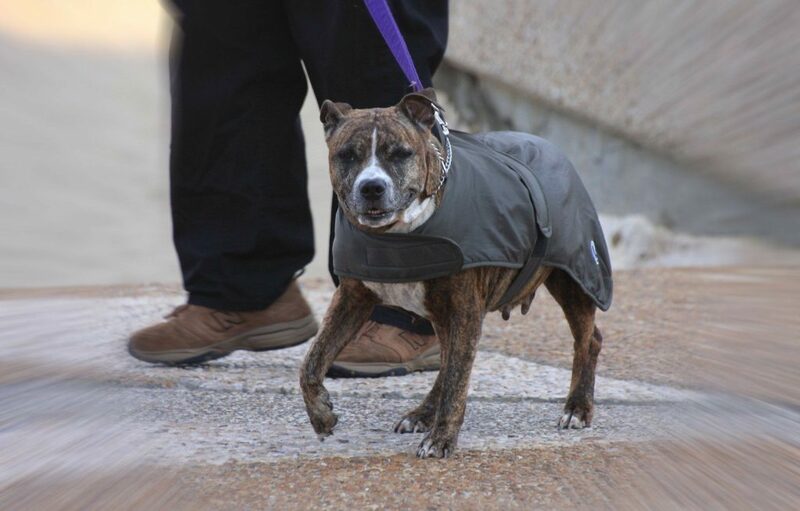 For cold weather a waterproof, fleece lined coat is ideal. When dressing your dog with other fabrics make he doesn’t get wet whilst wearing them. Looking dry, warm… and cool! Paw balms: using a balm for your dog’s paws might prevent them from becoming sore and cracked in the cold weather. They work by creating a protective layer that locks the moisture into your dog’s paws. Dog booties: if you live in an area where grit, antifreeze and ice abound, then dog booties might be an option to consider. 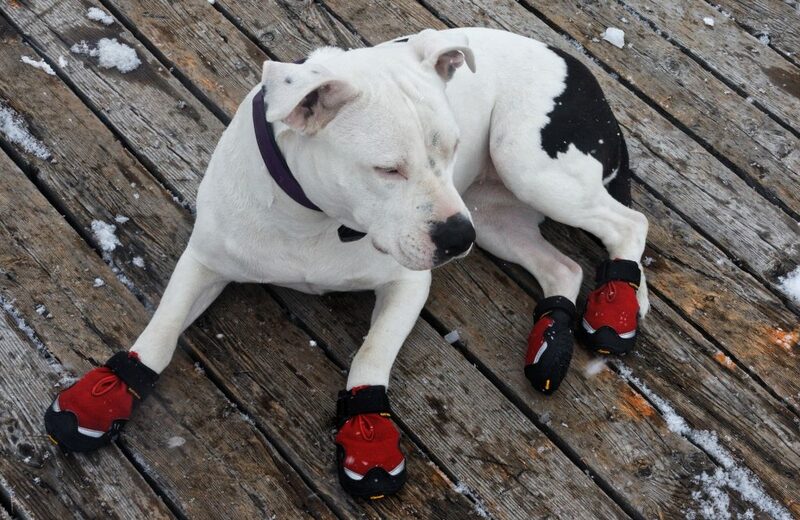 Dog Booties keep your dog’s paws dry and warm. Clean your dog’s paws after a walk: a little bit of your dog’s shampoo mixed with warm water is all you need to eliminate any salt, mud, snow and/or antifreeze off your dog’s paws. Warm, cosy sleeping nooks: according to the Blue Cross, you dog might feel the cold even if he’s at home. Make sure your dog’s bed is located in a warm part of the house and you provide your pooch with a blanket. Dogs with little to no body fat (such as Italian Greyhounds) might benefit from wearing a soft jumper or doggy pyjamas while indoors. Be seen! Don’t forget that the coldest months are also the darkest. While outside your dog might be wearing his coat, booties and even a hat! However, this does not mean you can see where your pooch is rambling. Fortunately, there are hundreds of products readily available to ensure your dog is visible. You can purchase LED collars, high viz vests and even glow in the dark balls that make sure you and your dog are safe and have fun while it’s dark. Dog Listener: Dogs and Winter Dangers. 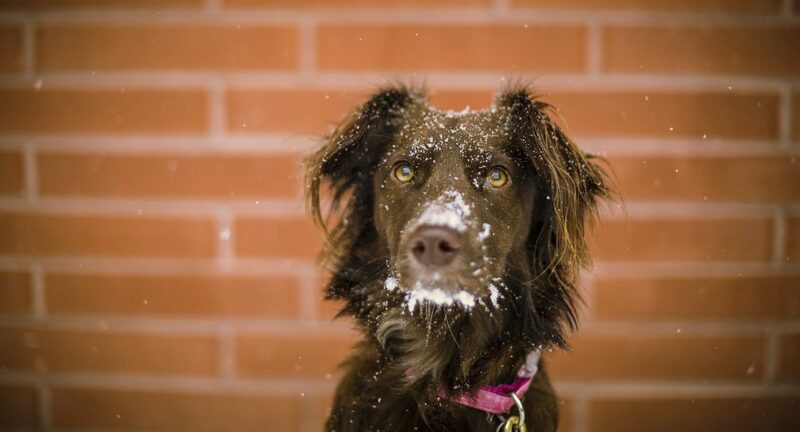 Embrace Pet Insurance: Dogs and cold weather: How cold is too cold?